The numbers don’t lie. They show that people are very much influenced by your smile. For example, studies indicate that 73% of Americans find people with nice smiles to be more trustworthy. Another study found that 87% would forego something they enjoy for a year in order to have a nice smile for the rest of their life. Thankfully, that’s not necessary, but your dentist does understand the mindset that the people in the studies spoke from, because a perfect smile is really that important. It not only influences how you’re viewed by other people, but also how you view yourself. That’s why he offers the remedy of porcelain veneers of Aurora. Learn more about how they can elevate your smile. Tiny Teeth – If your teeth are too small for your face, veneers can be used to build them up, leaving them looking fuller and more aesthetically suitable to the size and shape of your face. Crooked Teeth – In this situation, veneers help create a more symmetrical and even look to your teeth. Gapped Teeth – Porcelain veneers can also mask a small gap, leaving no traces that it ever existed, by being bonded over the area. 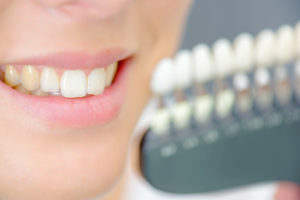 Misalignment – In cases of slight misalignments, where the jaw sits too far forward, causing an overbite, veneers can help build up the lower part to accommodate for the misalignment, creating a straight smile. Staining – In some cases, people have severe stains that can’t be corrected by teeth whitening. In these situations, veneers offer an excellent alternative. Choose the Right Shade – He will choose the correct shade of veneers to match the rest of your teeth. Prep – The next step is for your dentist to prepare your teeth for the veneers to be fitted to them by shaving a small amount of enamel. Impressions – He will also take some impressions of your teeth in order to have your permanent veneers crafted. In the meantime, he will give you some temporary veneers to wear. Second Visit – At the second visit, you’ll be fitted with your permanent veneers. One of the greatest benefits of porcelain veneers is that all of your imperfections can be addressed in just two visits. There’s no need to endure years of corrective measures. The perfect smile is just that easy to attain. Reach out to your dentist in Aurora to learn how you can benefit today. Dr. Matt Mauck received his undergraduate degree from LSU and then went on to earn his Doctor of Dental Surgery degree from the University of Colorado School of Dental Medicine. A member of the American Dental Association, Dr. Mauck practices at D’Amico & Mauck, DDS and can be reached for more information through his website.